Click Here to Get your 1st Edition Copy! 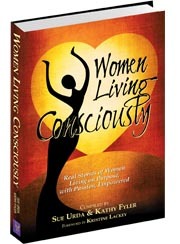 I am honored and proud to announce that I am a co-author in “Women Living Consciously”, a compilation of 47 inspiring women who have each enriched and re-directed their lives to transform into a new way of being. In the book, I wrote a chapter that tells my story from the time my husband was diagnosed with an inoperable brain tumor up to his funeral. I talk about the tough decisions, discussions, the leaps of faith and the blessings in disguise. I was compelled to tell my story because I know I am not alone. I know there are many of us out there who have experienced a major shift in consciousness because of our circumstances and I wanted to share how that feels and how we can sometimes take these events and turn them into healthy conscious living. The book is available to purchase on Amazon.com today and I would be thrilled if you would consider buying this book to be inspired not just by my story, but by the 46 other women who join me in sharing their personal journeys into Living Consciously! Thank you!